• The Generals continue their final homestand of the season, with game 4 of a 5-game series with the Chattanooga Lookouts (1-2). Jackson is 4.0 games back in 5th place in the North standings with 7 to play…Jackson closes the season with a 5-game road series at Montgomery (8/28-9/1). • The Generals scored 3 runs in the 1st inning and went on to end a two-game slide Sunday afternoon in a 4-2 win over Chattanooga. • 3B Patrick Kivlehan (1×4, HR, 2 RBI) blasted a 2-run home run in the first inning capping off a 3-run frame. The homer was his 11th for Jackson and 20th overall this season. • DH Jordy Lara (2×4) and SS Tyler Smith (2×4, 2 R) recorded multi-hit efforts in the win while 1B D.J. Peterson (1×4), RF Jabari Blash (1×3, R), CF Kevin Rivers (1×2, RBI) collected hits on Sunday. • Starter Tyler Olson (9-7, 3.73) become Jackson’s 9-game winner on the mound with 6.1 IP, 2 runs, 5 hits, 1 walk and 7 strikeouts in the win. RH Trevor Miller (1.2,2,0,0,0,1), LH Nick Hill (0.2,1,0,0,0,1) and RH Mayckol Guaipe (0.1,0,0,0,0,1) combined to shutout the Lookouts over the winal 2.2 innings. Guaipe earned his team-leading 11th save. • YOU (MAY) ALREADY KNOW that LHP Nick Hill was 1 out away from recording a save last night, but DID YOU KNOW? that had he of recorded the save it would of been his first since June 28, 2010 against Tennessee. It would of been just his 7th in 200 career games. • HIGH-WATER MARK…the Mariners are 71-58 (.550) reaching the high-water mark for the season at 13 games over .500…have not been 13 or more games over .500 since finishing the 2007 season 88-74 (14 games over). • The Mariners are curently 1 game ahead of Detroit for the second wild card spot and 6.0 games back of the LA Angels in the AL West. • The M’s also just completed the first ever 3-game sweep of the Red Sox in Boston and are 6-3 in last 9 games…have won 10 of last 13 and are 16-6 over last 22 games. • “LOOKOUT” It has been a while – The Generals are facing the Chattanooga Lookouts for the first time since a series April 19-23 in Jackson. The Generals are 6-7 against Chattanooga and 3-5 in Jackson this season. • Overall this season, Patrick Klvlehan, Jordy Lara and D.J. Peterson have put up impressive numbers that rank among the best in MiLB. Here is how they rank in all of MiLB and the Seattle Mariners organization. Lara currently is 2nd in all of MiLB in hits with 171 this season. Kivlehan, Peterson and Lara are the first Mariners farmhands to reach 100 RBI’s this season. • The Generals scored a run in the bottom of the 4th inning and rallied for 1 in each the final 3 innings, but Jackson fell to Chattanooga 15-4 on Saturday night. • 1B Dan Paolini (2×3, 2 R, 2B, BB) led the team with 2 hits, while LF Leon Landry (1×5), 2B Patrick Brady (1×5, R), 3B D.J. Peterson (1×2, R, 2 BB), CF Patrick Kivlehan (1×4, RBI), C Tyler Marlette (1×4, 2B) and SS Brock Hebert (1×4, 2 RBI) each recorded 1 of the Generals 8 hits. • Starter Cam Hobson (5.1,13,10,9,0,3,HR) recorded his 10th loss of the season, allowing 10 runs (9 R) on 13 hits in 5.1 innings. RH Moises Hernandez (1.0,7,5,5,3,3,HR) allowed 5 runs in the 6th inning, while RH Stephen Shackleford (0.2,0,0,0,0,1) and position player RH Kevin Rivers (2.0,3,0,0,0,2) combined to hold the Lookouts scoreless over the final 2.2 innings in relief. • YOU (MAY) ALREADY KNOW that Jackson’s parent club, the Seattle Mariners are 70-58 this season, but DID YOU KNOW? that with a win today in Boston, the Mariners would match their season total of 71 wins last season with 33 games still to play after today. 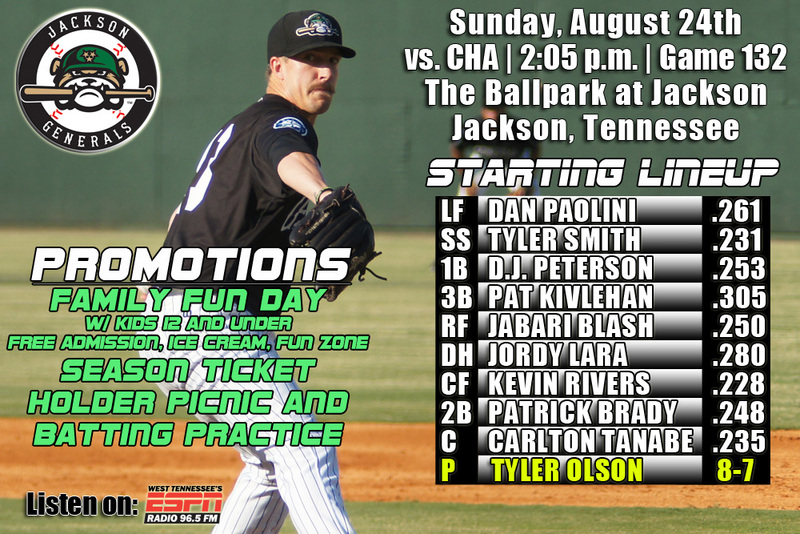 • A rare day game – The Generals are playing a game at 2:05 for the first time since June 15th, a 2:05 game with Jacksonville in Jackson. Today’s heat index at first pitch will be 107. 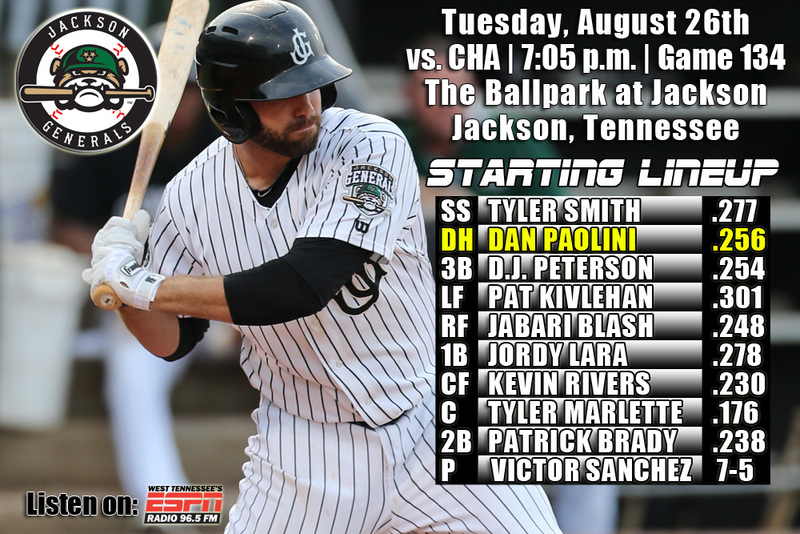 • “LOOKOUT” It has been a while – The Generals are facing the Chattanooga Lookouts for the first time since a series April 19-23 in Jackson. The Generals are 5-7 against Chattanooga and 2-5 in Jackson this season. • Familiar Names for Lookouts – Saturday’s 1B Alex Liddi, once a top prospect for the Mariners played in 134 games for Jackson in 2010, batting .281 with 15 home runs, 37 doubles, 8 triples, and had a .353 on-base percentage. The now 26-year-old wa a 2010 SL All-Star. • Leading the SL in Homers Since July 1st – After hitting just 40 home runs over their first 81 games, Jackson has hit 46 home runs over their last 50 games since July 1st which leads the SouthernLeague in that period of time. The Generals have hit 25 home runs in August and 10 in their last 7 games. • Today’s starter Olson finishing strong – Over his last 4 starts in August, LH Tyler Olson is 3-1 with a 1.09 ERA (3 ER, 24.2 IP). During this stretch he has limited opponents to a .223 (21×94) average, while walking 4 and striking out 20. After going 3-5 with a 4.56 ERA (36 ER, 71.0 IP) over his first 13 AA starts, Olson is 5-2 with a 2.41 ERA (11 ER, 41.0 IP) over his last 7 starts. • RH Trevor Miller has not allowed an earned run in his last 21.2 innings over 9 relief appearances. During this stretch, since July 24, he has limited opponents to a .192 (14×73) average, while walking 4 and striking out 18. • INF Dan Paolini has hit in 4 straight games with 2 multi-hit efforts. He’s batting .538 (7×13) with 3 doubles, 3 runs, 1 RBI and 3 walks. • The current active Mariners roster features 13 former Generals. 3B Kyle Seager was named an American League All-Star. • Overall this season, Patrick Klvlehan, Jordy Lara and D.J. Peterson have put up impressive numbers that rank among the best in MiLB. Here is how they rank in all of MiLB and the Seattle Mariners organization. Lara currently is T-1st in all of MiLB in hits with 169 this season. Peterson and Lara are the first two Mariners farmhands to reach 100 RBI’s this season. 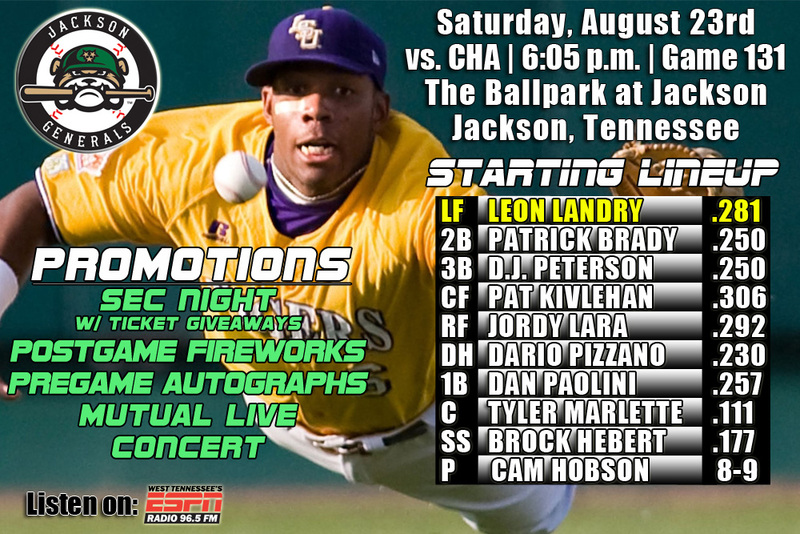 • RF Jordy Lara hit a 2-run home run with 1-out in the bottom of the 7th inning, but it wasn’t enough as Jackson fell to Chattanooga 7-3 on Friday night. • Lara (1×4, R, HR, 2 RBI) hit his 4th home run with Jackson and 26th overall this season. LF Dario Pizzano (2×3, RBI, BB) recorded the Generals only multi-hit contest. • YOU (MAY) ALREADY KNOW that 2011 General Kyle Seager hit his team-leading 19th homer of the season Tuesday for the Mariners in Philly, but DID YOU KNOW? that Seager needs one more HR to become the first Mariners player since Raul Ibañez (2005-2008) to record 20+ HR in at least 3 consecutive seasons. He would also join Ken Griffey Jr. and Jim Presley as the only Mariners players with 20+ HR in 3 of first 4 MLB seasons. • “LOOKOUT” It has been a while – The Generals are facing the Chattanooga Lookouts for the first time since a series April 19-23 in Jackson. The Generals are 5-6 against Chattanooga and 2-4 in Jackson this season. • Familiar Names for Lookouts – Friday’s 1B Alex Liddi, once a top prospect for the Mariners played in 134 games for Jackson in 2010, batting .281 with 15 home runs, 37 doubles, 8 triples, and had a .353 on-base percentage. The now 26-year-old wa a 2010 SL All-Star. • Leading the SL in Homers Since July 1st – After hitting just 40 home runs over their first 81 games, Jackson has hit 46 home runs over their last 49 games since July 1st which leads the SouthernLeague in that period of time. The Generals have hit 25 home runs in August and 10 in their last 6 games. • Olson finishing strong – Over his last 4 starts in August, LH Tyler Olson is 3-1 with a 1.09 ERA (3 ER, 24.2 IP). During this stretch he has limited opponents to a .223 (21×94) average, while walking 4 and striking out 20. After going 3-5 with a 4.56 ERA (36 ER, 71.0 IP) over his first 13 AA starts, Olson is 5-2 with a 2.41 ERA (11 ER, 41.0 IP) over his last 7 starts. • INF Jordy Lara has hit safely in each of his last 6 games, batting .320 (8×25) with 3 runs scored, 2 doubles, 3 home runs and 8 RBI. • OF Dario Pizzano has a hit in 7 of his last 8 games batting .370 (10×27), with 4 doubles, 1 home run and 6 RBI. • Overall this season, Patrick Klvlehan, Jordy Lara and D.J. Peterson have put up impressive numbers that rank among the best in MiLB. Here is how they rank in all of MiLB and the Seattle Mariners organization. Lara currently is 1st in all of MiLB in hits with 169 this season. Peterson and Lara are the first two Mariners farmhands to reach 100 RBI’s this season. 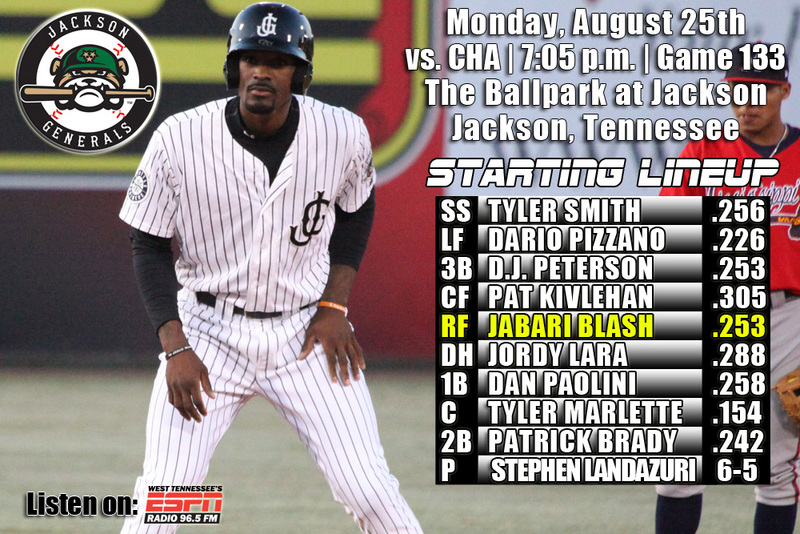 • The begin their final homestand of the season, with game 1 of a 5-game series with the Chattanooga Lookouts. Jackson is 5.0 games back in the North standings with 10 to play..
• DH Jordy Lara and C Carlton Tanabe each drove in a run in the 6th inning as Jackson defeated Huntsville 3-2 on Thursday night. • Lara (2×4, 2B, RBI) recorded the team’s only multi-hit hit game, while Tanabe (1×4, 2B, RBI) recorded the Generals only other run with a RBI double. • Starter Victor Sanchez (7.2,4,2,2,1,3) recorded his 7th win of the season, allowing 2 runs on 4 hits over 7.2 innings. Sanchez held the Stars scoreless over the first 6.0 inning, before allowing a run in each the 7th and 8th innings. His 7.2 innings is the 4th-longest outing in his career. • RH Trevor Miller (1.1,1,0,0,0,1) allowed only 1 hit in 1.1 scoreless innings to pick up his 4th save. • Since July 1, RH Victor Sanchez is 4-1 with a 3.02 ERA (20 ER, 59.2 IP) in 10 starts. During this stretch he has limited opponents to a .234 (51×218) average, while walking 17 and striking out 43. • YOU (MAY) ALREADY KNOW that the Generals and Lookouts are meeting for the first time since April 23rd, but DID YOU KNOW? that only 12 of Jackson’s current 25-man roster were active the last time the two clubs met. • “LOOKOUT” It has been a while – The Generals are facing the Chattanooga Lookouts for the first time since a series April 19-23 in Jackson. The Generals are 5-5 against Chattanooga and 2-3 in Jackson this season. • The Generals are batting .225 with 42 runs scored, while the Lookouts are hitting .210 and have tallied 44 runs in the 10-game season series so far. • Leading the SL in Homers Since July 1st – After hitting just 40 home runs over their first 81 games, Jackson has hit 45 home runs over their last 48 games since July 1st which leads the Southern League in that period of time. The Generals have hit 24 home runs in August and 9 in their last 5 games. • The Generals are in the midst of playing 21 games in 21 days to close the season (5-6) including 5 more home games against Chattanooga (8/22-8/26) with a road trip to Montgomery to close season (8/28-9/1). 5 of the final 10 games are against North Division foes. Jackson is 34-32 against their remaining opponents. • INF Jordy Lara has hit safely in each of his last 5 games, batting .333 (7×21) with 2 runs scored, 2 doubles, 2 home runs and 6 RBI. • OF Dario Pizzano has a hit in 6 of his last 7 games batting .333 (8×24), with 4 doubles, 1 home run and 5 RBI. • OF Leon Landry has recorded a hit in 10 of his last 12 games, batting .319 (15×47) with 8 runs scored, 2 doubles, 3 triples, 1 home run, 1 RBI, 2 walks and 1 stolen base. • Overall this season, Patrick Klvlehan, Jordy Lara and D.J. Peterson have put up impressive numbers that rank among the best in MiLB. Here is how they rank in all of MiLB and the Seattle Mariners organization. Lara currently is T-1st in all of MiLB in hits with 168 this season. 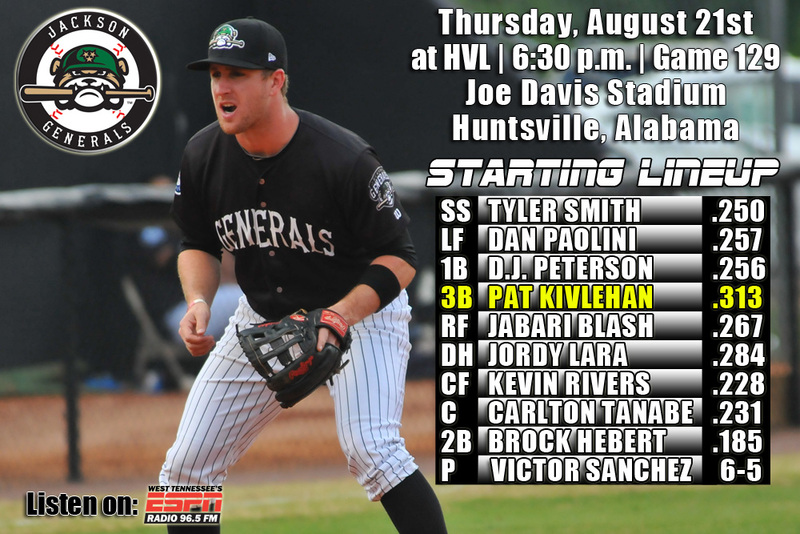 • The Generals conclude a 5-game road series at Huntsville (1-3) with game 5 of the set…this is Jackson’s 5th and final series with Huntsville this season and are 12-12 overall against the Stars and 5-9 at Joe Davis Stadium. • Every Jackson batter had a hit as the Generals out-hit Huntsville Wednesday night, 14-6, but fell 6-4 at Joe Davis Stadium. • 1B Dan Paolini (3×5, 2B) led the way with 3 hits, including his team-leading 29th double, while CF Leon Landry (2×4), SS Tyler Smith (2×5) and RF Jordy Lara (2×5, HR, 2 RBI) collected 2 hits each. • C Tyler Marlette (1×4, HR) and 2B Patrick Brady hit back-to-back solo homers in the top of the 4th inning cut the lead to 4-2 and Lara hit a 2-run home run in the 9th to trim the defecit to 6-4, but the 3 home runs were not enough. • Jackson stranded 14 runners on base and finished 0-for-12 with runners in scoring position. • Starter Stephen Landazuri ( 2.2,2,4,4,4,1) suffered the loss and RH Stephen Shackleford (2.1,3,2,2,1,1) allowed 2 runs in relief. LH Nick Hill (2.0,1,0,0,0,4) and RH Mayckol Guaipe (1.0,0,0,0,0,1) tossed 3.0 scoreless innings of relief. • YOU (MAY) ALREADY KNOW that Tyler Marlette hit a home run for his first Double-A hit Wednesday, but DID YOU KNOW? 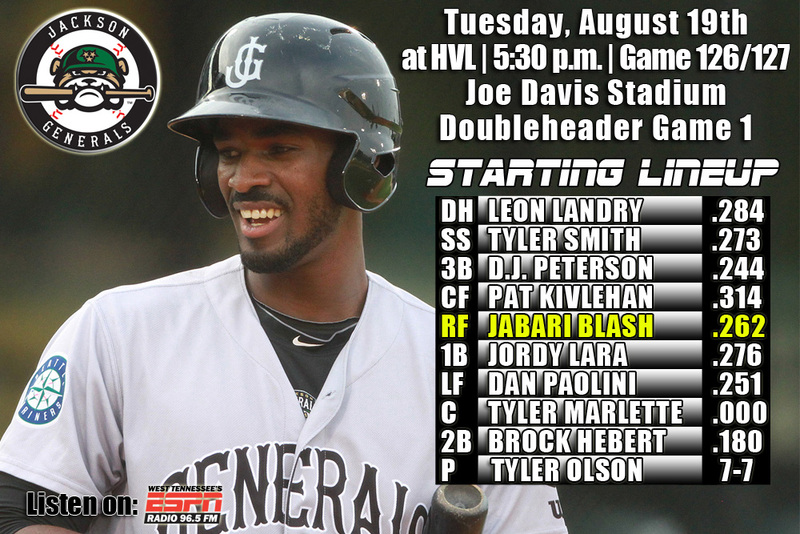 that the last General that had his first hit a home run was Jabari Blash on August 2, 2013 at Mobile. That was Blash’s first overall at-bat. • Final Trip to Huntsville for Jackson – Tonight marks the final game between Jackson and Huntsville at Joe Davis Stadium. The franchise is moving to a brand new ballpark in Biloxi, MS for 2015. 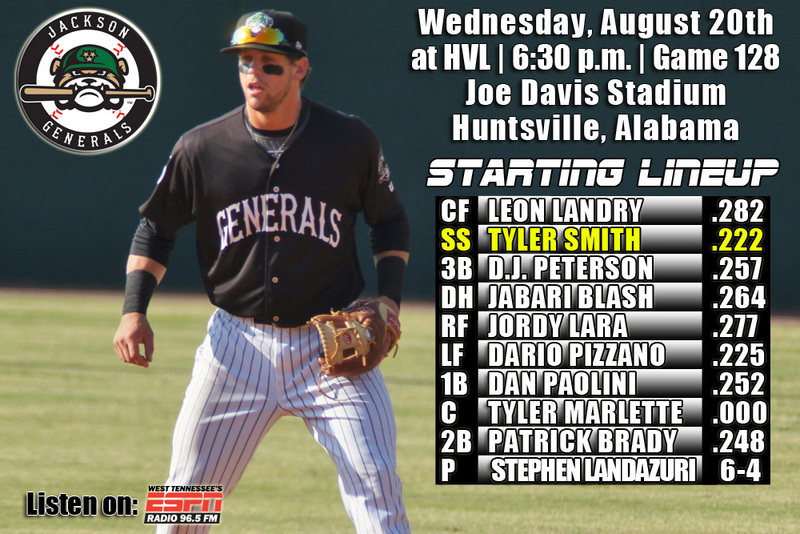 • The Generals are 12-12 against Huntsville this season and are batting .282 with 21 home runs. 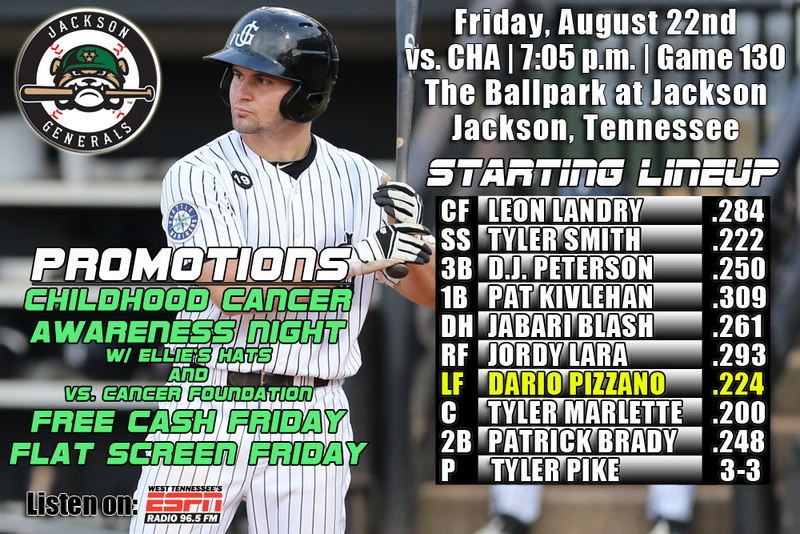 The Stars are batting .255 against Jackson and the Generals have out-scored the Stars 114-100 in the 24 games. 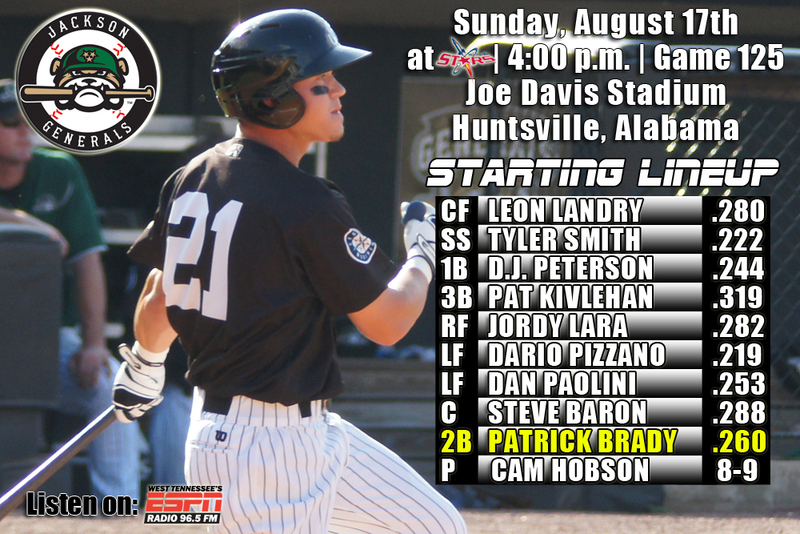 • Leading the SL in Homers Since July 1st – After hitting just 40 home runs over their first 81 games, Jackson has hit 45 home runs over their last 47 games since July 1st which leads the Southern League in that period of time. The Generals have hit 24 home runs in August and 9 in their last 4 games. • The Generals are in the midst of playing 21 games in 21 days to close the season (4-6) including 5 more home games against Chattanooga (8/22-8/26) with current road trip to Huntsville and Montgomery. 6 of the final 11 games are against North Division foes. Jackson is 33-32 against their remaining opponents. • Overall this season, Patrick Klvlehan, Jordy Lara and D.J. Peterson have put up impressive numbers that rank among the best in MiLB. Here is how they rank in all of MiLB and the Seattle Mariners organization. Lara currently is 1st in all of MiLB in hits with 166 this season.